I ran out of prepaid load this morning and I got so bored. The loading station is far from our house and I was too lazy to walk. I thought of ways on how I can have load; first, ask my mom to send me load [she'll probably scold me on second thought #lols], second, ask my lil' brother to go home and send him to the loading station [ehermmm] and third, ask Mr. Google if GCASH is convertible to load! Yes, GCASH to LOAD. I was really curious if that is possible. [Sorry, I really didn't know, so?] haha. Then Mr. Google was kind enough to inform me. [Atleast the idea popped into my cocoshell, ey?] That's what boredom does anyway. You forge into the unknown [or known?]. #lels. Ang gulo ko kausap. :)) tahaha. 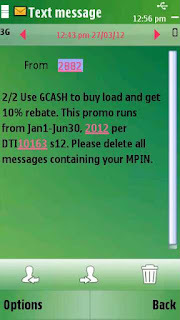 Note: You MUST have a GCASH account with balance ofcourse. Even the dumbest creature on earth should know that. #lels. Just type LOAD [space] AMOUNT [space] MPIN then send to 2882. Yes, as simple as that! 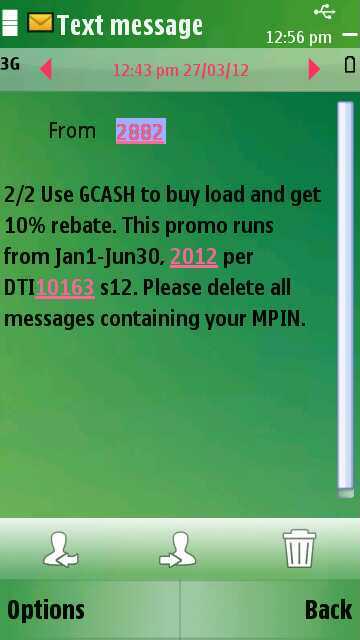 Example: LOAD 10 1234 send to 2882 where 1234 is your mpin. You will then receive a notification that you successfully loaded 10php to your OWN number. QUESTION: Can I send load to other number/s? ANSWER: Yes! Just type in LOAD [space] AMOUNT [space] MPIN then send to 2882+10digit mobile number where you want to send load to. Example: LOAD 10 1234 send to 28829271234567. 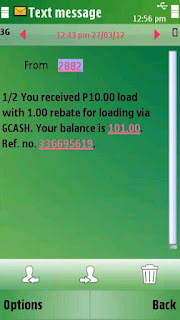 For example, I loaded 10php earlier <as per screenshot above>, GCASH only charged me 9php. If I loaded my phone thru Reloading Station, they would have charged me 12php. So, I approximately saved 3php, right? The only thing I don't like about gcash is that you can't use your gcash to buy load if your load balance is 0. But the last time I tried was a few years ago, I dunno if Globe has changed that now. Thanks for the tips. 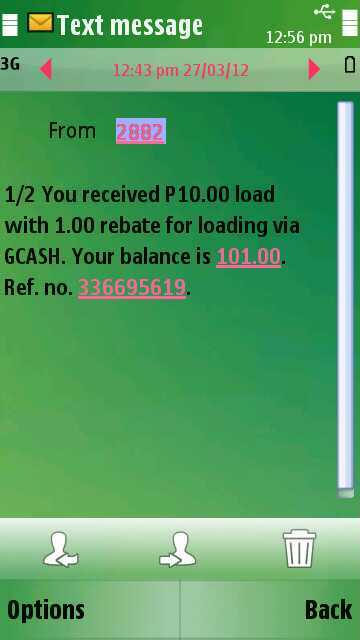 I'm going to convert my GCash to load credits. I'll try that one when I ran out of load. Gcash is so helpful tlga. good thing I registered na.